As 2015 draws to a close, you’d be hard-pressed to find anyone who’d claim that it’s been a good year for the human race. The bad news has been relentless: war in Syria, a refugee crisis in Turkey and Europe, earthquakes in Nepal, terrorist attacks in Paris, mass shootings in the US, floods in India. With the media screaming blue murder and social media feeds filled with complaints about how selfish/materialistic/short-sighted our fellow human beings are, you’d be forgiven for thinking that the world is going to hell in a handcart. In April this year, Unesco released a report on the status of global education, showing that in the last 15 years the number of children around the world without access to education has nearly halved, from 100 million to 57 million. This is thanks to an increased appreciation of the benefits of education to the individual and society, increased government provision, and increases to mandatory minimum years of schooling. It’s an incredible achievemen: it means that we are in a world where nine out of 10 children are learning to read and write. The World Bank now says we’re only one generation away from a world where every single person is literate. 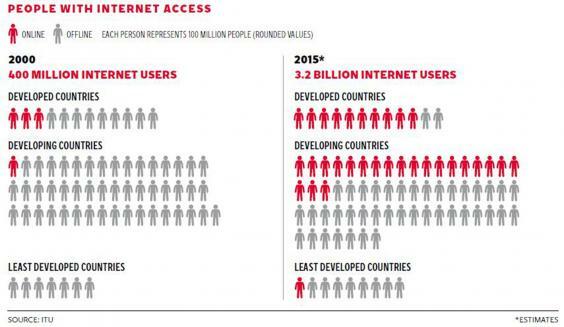 Globally, there are now 3.2 billion people online, two billion of whom are from developing countries. In 2000, those numbers were 300 million and 100 million respectively. It means the number of people with internet access has seen an eightfold increase in just 15 years. Of course, there’s still a long way to go. 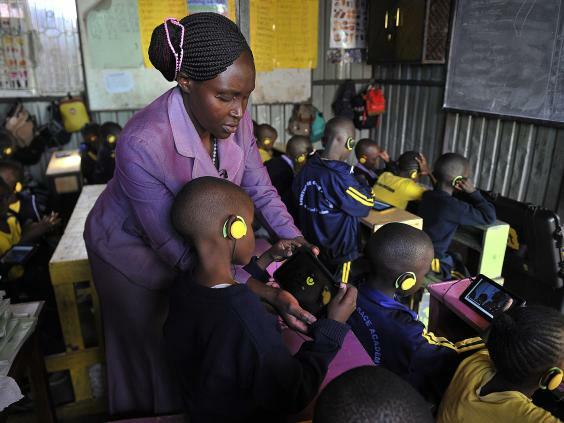 In the least developed countries, only 9.5 per cent of the population have internet access, compared with 35.3 per cent for developing countries and 82.2 per cent for developed countries. But those numbers are changing fast. Africa’s internet capacity, for example, has grown by 51 per cent over the past five years. And mobile phones are leading the charge. Globally, subscriptions number more than seven billion, and 95 per cent of the world’s population are now within reach of a mobile network signal. This year showed us that the next billion people coming online will do so from cheap mobile phones. There have been no courses, no tutorials, no NGOs showing up to “deploy” phones or to train people. The mobile internet is so intuitive, and so obviously useful, that it’s become the quickest technology uptake in human history. For every 10 people who gain internet access, around one person is lifted out of poverty and around one new job is created. And remember: thanks to our successes in education, all of those new users can read and write. They represent tens of trillions of dollars of new economic buying power, and an extra billion people who’ll have the networking ability of the internet at their fingertips. In April this year, a little-known organisation called Global Findex released the largest global research project on financial inclusion in history. Based on interviews with 150,000 adults in more than 140 countries, it showed that between 2011 and 2014 an additional 700 million people became account holders at banks, other financial institutions, or mobile money service providers, and the number of “unbanked” individuals dropped by 20 per cent. This trend was driven in particular by new mobile money accounts. Countries such as Ivory Coast, Somalia, Tanzania, Uganda and Zimbabwe now have more adults using a mobile money account than an account at a financial institution. This matters, because access to financial services is widely perceived to be a driver of development, especially in low-income countries, where 54 per cent of the population have no access to traditional banks. That’s why the mobile explosion has been so important. For the 700 million people who just gained access to finance, digital payments, through a mobile phone or a point-of-sales terminal, create opportunities to provide more convenient and affordable payment options. It means they’ll be able to start businesses, save and transfer money, invest in education, and deal better with financial shocks. In the 1980s and 1990s, Aids was seldom out of the headlines. We got used to seeing daily reports of the devastation it caused, and many people expected the death tolls would continue to rise. For the 37 million people around the world living with Aids today, though, the disease is both treatable and preventable. Thanks to a concerted global effort to improve access to antiretroviral drugs we’ve turned the corner in our fight against this terrible disease. UNAids says that 41 per cent of all people who are HIV-positive are now being treated, nearly double the percentage in 2010. There were two million new HIV infections around the world in 2014-15, the lowest since 2000. Deaths are also coming down, from a high of two million in the early 2000s to 1.2 million this year. 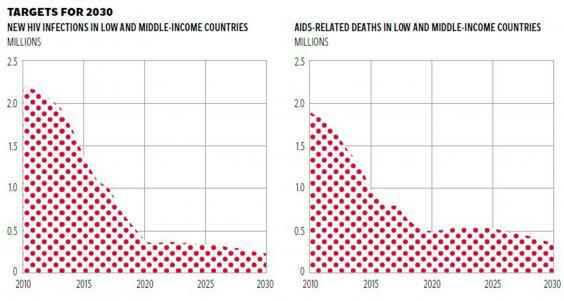 As the graphic on the right shows, the goal of UNAids is to end the epidemic by 2030. It will take more money, more political support and more work. But what we saw this year was that the possibility of an HIV-free generation is now within sight. Malaria is one of the world’s biggest killers, responsible for more deaths than all car accidents around the world. In the past decade, though, we’ve finally got serious about tackling the disease. That’s thanks to the scale-up of three key malaria control interventions: insecticide-treated mosquito nets, indoor residual spraying, and artemisinin-based combination therapy. Since 2000, for example, nearly one billion insecticide-treated mosquito nets have been distributed in sub-Saharan Africa alone. Mortality rates have declined by 85 per cent in South-east Asia, by 72 per cent in the Americas, by 65 per cent in the Pacific, and by 64 per cent in the Middle East. 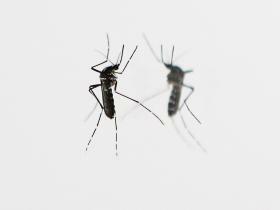 While Africa continues to carry the highest malaria burden, over the last 15 years mortality rates have fallen by 66 per cent among all age groups, and by 71 per cent among children under five, a population particularly susceptible to the disease. Globally, the number of malaria deaths fell from an estimated 839,000 in 2000 to 438,000 in 2015. That means we’ve saved an estimated 6.2 million people from malaria in the last 15 years – an amazing achievement no matter which way you look at it. Twenty-five years ago, a number of international healthcare organisations set out on a quest to stamp out polio throughout the world. With 350,000 children affected and more than 1,000 paralysed daily, it seemed like an unlikely goal. Since then, more than $9bn has been invested, and more than 2.5 billion children across the world have received vaccinations. As a result, the number of polio cases has been reduced by 99 per cent, and this September the World Health Organisation announced that polio was no longer endemic in Nigeria, paving the way for it to become the final African nation to be declared officially polio-free in 2017. That leaves just two countries with wild polio cases: Pakistan and Afghanistan. If, as health professionals predict, the 334 cases found there are eradicated within the next few years, then a disease that once killed and maimed children in their tens of thousands will join smallpox and the guinea worm as plagues consigned to history. Of the 7.3 billion people on the planet, an estimated 805 million – or one in nine – suffered from chronic hunger between 2012 and 2014. However, that number has dropped by around 200 million since a quarter of a century ago. That’s pretty impressive, especially when considering that the world’s population grew by 1.9 billion people during the same period. And the rate of hunger is also declining. 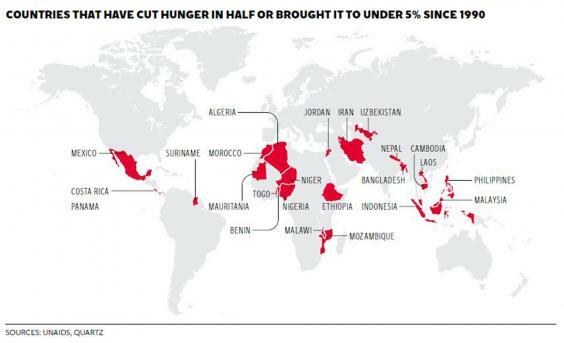 In 1990, one of the goals we set ourselves as a species was to halve the hunger rate. Today, 72 of 129 developing countries have met that goal. That’s happened in countries with huge populations such as Nigeria and Ethiopia, and also in smaller countries such as Malawi, Ghana and Mali. Globally only 12.9 per cent of the population in developing regions are hungry today, compared with 23.3 per cent a quarter of a century ago. One of the least talked-about success stories of 2015 was one of the most important. This year, the number of people without access to improved drinking water fell below 700 million for the first time in history. It means that more than 6.6 billion people, or 91 per cent of the global population, now use an improved drinking-water source, up from 76 per cent in 1990. In 2015, only three countries – Angola, Equatorial Guinea and Papua New Guinea – have clean-water coverage of less than 50 per cent, compared with 23 countries in 1990. 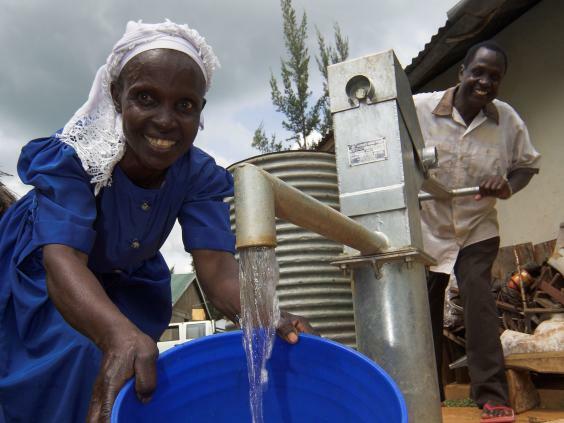 In sub-Saharan Africa 427 million people gained access to clean drinking water, an average of 47,000 people per day, every day, for the last 25 years. The mortality rate for children under five has dropped in virtually every country. This is thanks to progress in the fights against diseases such as malaria and tuberculosis, vitamin A supplements, new HIV/Aids medication and better treatment of diarrhoea and pneumonia. It means that in 2015, for the first time on record, the global child mortality rate (defined as child deaths under the age of five) dropped below the six million mark. In the last 25 years, roughly one-third of the world’s countries – 62 in all – reduced under-five mortality by two-thirds, while another 74 reduced rates by at least half. And the progress has come from some of the worst-hit countries; 10 of the 12 low-income countries that reduced under-five mortality rates by at least two-thirds, for example, are in Africa. This means that about 19,000 fewer children died per day in 2015 than in 1990, the baseline year for measuring progress. Since 2000 alone, we’ve saved the lives of 48 million children. Think about that for a second. That’s higher than the combined totals of all deaths from war and violence around the world during the same period. It means that fewer parents, as a proportion of the world’s population, had to bury their children this year than at any other time in human history. It’s one of the most astonishing news stories of our time, and yet it was outnumbered 100 to 1 by stories on terrorism. Three big things happened in climate change politics this year. The first is that 2015 looks set to be the hottest year on record. That means that temperatures have now risen by 1C since the Industrial Revolution. The five-year period between 2011 and 2015 is also the hottest on record; and as the records tumble, the claims of climate change deniers are becoming increasingly ridiculous. We’ve turned the corner; denial is no longer being taken seriously. The world has moved on, and contrarians have become irrelevant relics of the fossil fuel age. The second thing is that thanks to sharp declines in Chinese coal-burning and a continued surge of renewable energy worldwide, 2015 looks set to be the first year in history that CO2 emissions declined during a year when the overall global economy grew. That follows from 2014, where emissions flatlined. The Chinese data is particularly important. Whether their energy transition is permanent is not clear yet, but the signs are encouraging. In wealthy, developed countries, on the other hand, the signs are obvious. They’ve hit a peak in overall fossil fuel consumption and are now making the transition to cleaner forms of energy. The third, and most important, thing that happened for climate change this year was the signing of the Paris Agreement. At its core is a so-called “long-term goal” that commits almost 200 countries to hold the global average temperature to below 2C above pre-industrial levels and to “pursue efforts to limit the temperature increase to 1.5C”. The long-term goal also states that in the second half of this century, the world should get to a point where the net emissions of greenhouse gases should be zero. It’s easy to be cynical and maintain that nothing is ever getting better. The empirical evidence flatly contradicts this view; looking at what we’ve already achieved as a species should give us confidence going forward into the future. We constantly underestimate humanity’s abilities to work co-operatively, meet new challenges and expand global prosperity and basic freedoms. We now have a window of opportunity to create the greatest era of sustainable progress in human history. Doing so will not be easy, just as it has not been in the past, and it will take courage, sacrifice and strong leadership. But the potential gains are staggering. And if we can pull it off, we might just be on the cusp of a golden age for the human race and for the earth we live on. Dr Angus Hervey is a political economist, science communicator and co-founder of Future Crunch, a forum for critical debate on the transition from the industrial to the digital era. He is also the Australian manager of Random Hacks of Kindness, a global initiative connecting technologists with charities and community groups, to create open-source solutions to social challenges. This article was recommended by a commenter at Chris Hedge’s tough article http://www.commondreams.org/views/2015/12/28/illusion-freedom. I don’t read the two as conflicting but complementary. So glad for Popular Resistance and Mr Zeese and Dr Flowers, and for Mr Hedges, our Jeremiah. I thought this one was a bit odd for PR–hooray that everyone’s connected, everyone is a potential customer, a couple of diseases are being eradicated maybe…but what about the fact that humanity is marching face-first into environmental catastrophe? Then at the end we do get mention of climate change, with dubious assertions that we’ve turned the corner. But the reality is that while occasionally in specific places you can “grow the economy” and reduce emissions (and other environmental impacts) at the same time, especially if the emissions are calculated by people who get to not count certain little things like the US military, rather than MEASURED…in the long run survival, let alone quality of life, depends upon reducing our numbers and our per capita impact. It’s great that childhood deaths have gone down but this just means the birth rate MUST go down too or we face a time when death rates of everyone skyrocket–yet in most quarters it’s taboo to even breach the idea of limits. And limits to consumption? Equally unthinkable. I can imagine a country where the number of people living under $1.90 a day, not connected to the internet or finance, grows–and it’s a good thing, because they’ve chucked the globalized economy and are living cooperatively and producing their own food and other needs. These things are good, but we have enough productivity and resources to provide the entire planet with the basics: water, food, housing, clothes, clean air, medical care, education. We can and must do better than this. 805,000,000 people suffering from chronic hunger is not one of the good things happening in the world. The recent climate talks was basically a greenwash by corpororate polluters. We are near the end of a Global Corporate Coup that threatens to put us all in debt servitude to Global Billionaires, which will be cemented in place with the next three big trade deals. Democracy is a wholly owned subsidiary of Global Banks Inc. But people are waking up to this. In response there is a Movement of Movements growing across the world. We will create a new paradigm that takes the best of socialism, anarchism, and market economics. We will invent a new system that makes sure everyone has the basics after working a short work week, so that they can use their creativity and productivity to reach their highest potential, without straining the planet with dirty energy and giant piles of disposable crap. To do this world culture will have to evolve to a higher level, more trusting and more trustworthy, a wider ability to love those far away in time and habits. The good news is that younger generations, by being able to communicate with people around the world, get to know the thoughts of others before they see skin color and clothing, are less willing to label people as “other,” and are demanding respect for all people. Really? I’ll believe it when I see it. Don’t wait to see it. Make it happen! Oh, please. Many of us who read these sites have been trying to make it happen for years. In some cases, all our lives. We’re still constrained by human nature, and human nature isn’t all sunshine and rainbows (despite what anarchists would like to believe).